Many of you would’ve known that I was in Rajasthan until a few days back and I hoped to meet lots of strangers there. But I did not meet many. Many of the people I interacted with didn’t feel like strangers strangely. Getting back to this lady, we were in the remoteness of Shekhwati region visiting old cenotaphs of Parsurampur. It was a single dome structure with exquisite paintings from Ramayana and Mahabharata and more such Indian Mythology. We were wowed by it and as we prepared to leave, the local villager asked us to pay 200 bucks as the entrance fee. We were surprised for sure at the demand. We refused upon which he said why don’t you come have a look at the care taker and then refuse. We obliged and followed him only to find this lady standing by the door of her home. She stood and greeted us with a pleasant namaste. She looked old but there was a spark in her eyes that you can see. We didn’t feel like denying the request and paid her the 200 rs. Her husband used to be the caretaker until recently but now she has taken over. I suddenly remembered the 100 Strangers project and promptly asked her if I could take her photo. She nodded and looked anxiously into my camera. I was looking through the lens and she didn’t show any signs of easing up. I asked her how old she was. She laughed and she said over 60 years. I asked her name – she said Shanta. I asked her to smile and there – A brilliant smile that showed her beauty come alive! We bid adieu and turned to move when we noticed. The youth in her face does seem to echo in her body. She was standing tall alright but she could barely move. 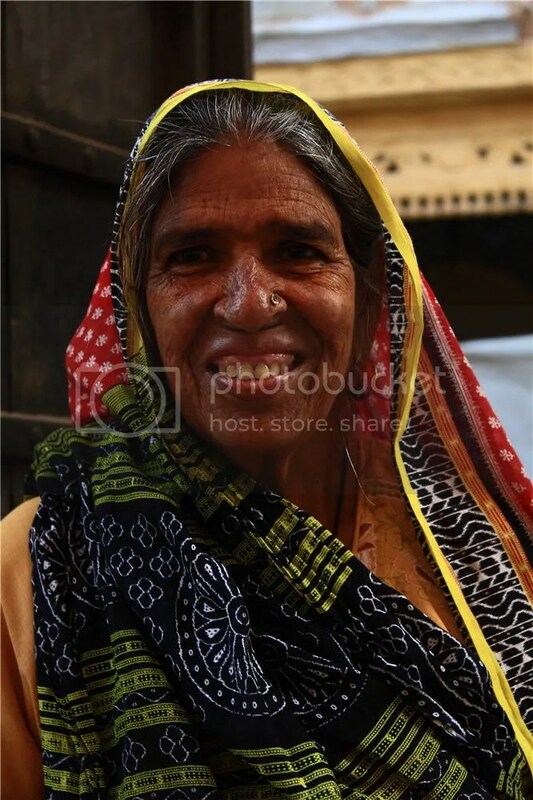 This entry was posted on January 10, 2011 by Neelima V. It was filed under Uncategorized and was tagged with 50mm, lady, old, red, shekhawati. nice expression and liked the colorful saree! Hmm, I don’t quite understand, 1-3 stranger stories? Strangers #19 and #20 – Women of Wilderness! Strangers # 15 & #16 – The Lady who wouldn’t take no for an answer! Stranger # 14 – The lady whose name rhymes with Ka Ching! Stranger # 11 – The little girl who hates to have her photo taken. Stranger #09 – The stranger whom I met twice. Strangers # 07 & 08 – Naughty kids who played cricket with lemon.